Ken Adams writes about poker for CBSNews.com. My wife and I had theater tickets that night, so I couldn't leave until 11 p.m. The good news was that the roads were empty, and we sailed along at warp speed. We drove straight to the Borgata so Larry and I could buy in for the 11 a.m. Sunday tournament. That way we could sleep late and would not have to stand in line with the last-minute entrants on Sunday morning. In the first of several fateful decisions, I suggested to Larry that he buy in first while I counted the wad of $20 bills I would be using for my entry fee (left over from my Friday night monthly poker game in which everyone wanted to be paid out in $100 bills at the end of the game, and I ended up with all 20s). Larry got a great seat assignment — Table 9, Seat 1. I was unhappy with my seat assignment — Table 17, Seat 6. Phil Gordon (author of "The Little Green Book of No Limit Hold'em") persuaded me long ago that the No. 1 seat is the best seat at a tournament table, as you can easily observe the players who will act after you on each round of betting and they are critical to your ability to "steal" blinds and antes. In the No. 6 seat, you cannot observe the players to your left and right without being obvious, which makes it less likely you will pick up unconscious "tells." After buying in, we drove over to Harrah's, where Adam had arranged two rooms for us before he had to cancel. We checked in and decided to test our luck at the craps table before bed. The first shooter made money for the table, but those gains were quickly wiped out by the next shooter. Larry and Fulton gave up and went to bed. I stopped at the blackjack table, where I won back half of what I had donated at the craps table, and finally called it a night around 4:30. After showering and breakfasting in my room Sunday morning, I met Larry and Fulton and we headed over to the Borgata for the tournament. Fulton was not planning to play in the tournament, so he took a seat in a cash game while Larry and I did battle in the tournament. A total of 331 tournament players paid $1,000 each for a chance to win a $60,000 package consisting of entry vouchers for four WPT tournaments in 2007 plus $5,000 cash for travel expenses. The top 5 finishers would each win a $60,000 package. The remaining $31,000 in the prize fund would go to the sixth- through ninth-place finishers. Those who finished sixth, seventh and eighth would win an entry voucher for the $10,000 WPT tournament at the Borgata in January. The ninth-place finisher would get the remaining $1,000 in cash. I have a spooky history of being dealt the winning hand in the first hand of tournaments. No matter how strong or weak the hand I am dealt, it usually turns out to be a winner. But you won't get far in tournament poker playing bad hands on the hunch that the flop is going to connect with your weak cards. So I made the "correct" decision on the first hand of the tournament and folded my A-4 off suit in first position. Of course the flop came 5-3-2 and I missed the chance to win a big pot. During the next 90 minutes I won a few pots and lost a few. Mostly I was dealt poor cards and folded. The blinds increased at the end of each 40 minute "level" of play. I ended the second level with 10,100, just slightly more than the 10,000 chips each player had started with. I checked in with Larry during the break and learned that he had won a dozen pots, flopping several sets and being dealt several premium pairs that held up. I was happy for Larry, but couldn't help thinking that it would have been my seat had I not suggested he go first at the cashier's window while I counted out my $20 bills. I continued to tread water during the next two hours, winning a few and losing a few. I made enough profit to offset the price of the ever-increasing blinds, and ended the fifth level with 10,375 chips. With the blinds and antes totaling 1650 each hand, those of us who had not amassed a lot of chips had to start playing more aggressively in an effort to fortify our stacks. Finally during Level 6, I got some decent cards in good position and was able to build my stack a bit. Most satisfying of all was that I had a chance to put to work some of the things I learned from Dan Harrington, who recently published volume 3 of his outstanding series on tournament no limit hold'em. Volume 3 is a workbook that gives you a chance to apply the lessons of volumes 1 and 2 in actual tournament situations that Harrington (or another top pro) has faced. You work through 50 problem sets, answering in multiple choice format whether you would have folded, called or raised in each situation described by the author. At the end of the book you total up your scores and get your "grade." A perfect score is 500. I scored 400, which Harrington classifies as "A very good player who should show a solid profit in big tournaments." From his lips to God's ear, as the Yiddish saying goes. In one hand, I picked up 7-7 in the small blind. The chip leader called in early position, and a late position player raised to 3000. That represented more than half his chips, so he was committed to the pot, but for some reason he had not made the standard play of moving all in. I couldn't tell whether he wasn't wild about his hand (A-Q or perhaps a small pair) and didn't want to risk the rest of his chips until he saw the flop, or if he was slow-playing a big pair. I ended up doubling my stack to 28,025 chips by the end of level 6. By the end of Level 8, I had increased my chip count to 32,000 despite the increasing blinds and antes. There were about 100 players remaining at that point, so the average chip count was around 33,000. I had another opportunity for an isolation play when I was dealt Q-J of clubs in the big blind. One of the big stacks opened for 9000 and the player on my right called all-in for his last 6600 chips. 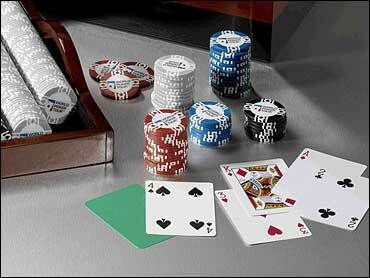 I re-raised all in, hoping the big stack would fold. I would win the 2400 side pot and would play heads up against the all in player for the rest. It worked. The big stack folded, and the all in player turned over 6-5 off suit! I was a 2 to 1 favorite, but he connected with the flop and I didn't. He ended up making three 5s and scooped the 25,000 pot. Then I picked up A-Q in late position. One player called, and the player on my right moved all in again (this time with 7-7). I re-raised all in, again hoping to get heads up with him. The player who had initially just called thought for a long time, and finally called my re-raise. He turned over A-K suited. I caught a queen on the flop, enough to beat the all in player's 7-7. But the other player caught a K and I was eliminated. Had I won either of those two pots (Q-J suited vs. 6-5 or A-Q vs. 7-7 vs. A-K) I would have remained in contention. Instead, I was on the rail. My only consolation was that I felt I had played well enough to win. I just couldn't pick up enough hands or win enough pots to survive the escalating blinds. We didn't get home until 4:30 a.m. Monday morning, but at least one of us was wearing a laurel wreath.